Sometimes, you truly are your own worst enemy. Late afternoons in Millbrook, Alabama were terrible. I learned that very quickly. The heat, the bugs, and the humidity were such a terrible mix. Dense grass and burnt, blistered hands made for grueling rehearsals. Surely through all this suffering I would be able to conquer anything, it seemed. I was wrong. The biggest obstacle I'd ever face turned out, as cliché as it sounds, to be me. I joined Southwind Drum and Bugle Corps for the 2017 season, and my rookie year would definitely showcase the impact of these negative thoughts. We were not even a week into tour when I first "broke." I had survived all-days, but once we hit the road, it seemed that I couldn't continue. That day, the pressures were particularly immense. 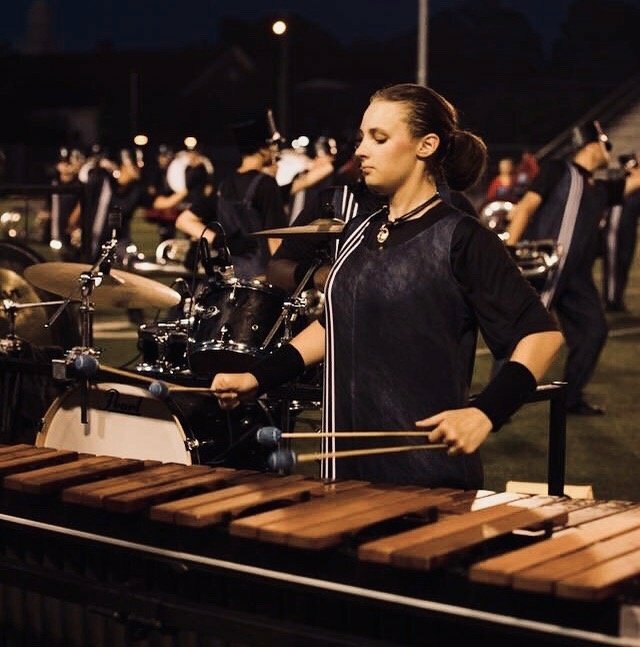 I had been newly promoted to the marimba line, been given only nine days to learn the full show, and now we were on tour. Competition would start that very day. Needless to say, the odds were stacked against me. The grass on the field was extremely, almost unnaturally thick, making for a hellish and painful push. I'm already a small person, and of course only being a week or so into my rookie season, I didn't have the muscles for it yet. The sun was beating down on us; the temperature came close to 100 degrees. The marimba itself - yeah, the big thing I have to push around a field all day - was actually at least twice if not three times my size. On top of it all, we were under a time limit which, if violated, resulted in a penalty for the whole corps. I could continue on for ages about all the external factors that made my experience difficult, but I would be completely ignoring the point. Those external factors made my experience difficult, not impossible. The factors weren't the problem itself. I was the problem. I didn't believe in myself. Negative thoughts thrive in negative environments. As such, the aforementioned circumstances resulted in a copious quantity of self-doubt, self-loathing, regret, and other wonderful feelings. My own negative thinking patterns created the problem. How does one overcome oneself? It's almost paradoxical. In retrospect, I've struggled with myself for far longer than just in drum corps, and I still struggle today. But that sweltering day, in the middle of Millbrook, Alabama, I was given something that has helped me tremendously in my fight to extinguish my negative thinking patterns. That day, in the middle of my push onto the field, my legs locked up. My thighs were screaming, and I was pretty close to doing the same if I hadn't been biting down on my lip. I was leading the whole line of front ensemble onto the field, so I had to keep going. I tried to. But I couldn't. I heard my section called out from the press box: "That's two minutes already! Front ensemble has thirty seconds to get set!" The pain of pushing the board mixed with the pain of the humiliation I'd caused myself and my section. I began to cry. My technician, Kirstyn (whom you may remember from my previous article), ran to my side. Tears were streaming down my face, probably leaving streaks of sunscreen washed away. I thought she'd help me push. She didn't. All she did was stare at me. I still remember her eyes, icy blue and filled with confidence, like she was willing it with everything she had to transfer to me. I remember sobbing. At this point, I'm still pushing, but barely. She said two words to me, and those two words changed my entire life: "Keep pushing." I'd love to say that something clicked into place. I'd love to say that those two words filled me with strength and my speed skyrocketed, bringing me and my section to our place in time. It didn't happen like that, of course, but the fact that it didn't have some magical effect on me speaks to me. It shows that overcoming oneself has always been and will always be a long process, filled with successes and failures just like any other. More than anything, those words fill me with hope. Hope that I can get through whatever obstacle I'm facing. Those words have become a sort of mantra for me, and I am immensely glad to have received that advice. I've taken on so much more in my life than ever before thanks to the hope it brings me. If you're ever facing an obstacle, be it yourself or otherwise, keep pushing. You'll thank yourself after the fact.